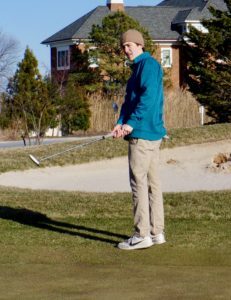 The Cape Henlopen High School golf team’s 2019 season began on a typically cold, blustery day at Rehoboth Beach Country Club March 26. The Vikings lost to the Caesar Rodney Riders, 168-184. Caesar Rodney’s Weston Harrington won medalist honors with a very good 3-over par 35. Saxon Kalb putts during the March 26 match against Caesar Rodney. His judgment wasn’t off the entire round. On the par-5 ninth, Palmer pitched nicely to the green above the hole and sank a tricky putt for birdie. Reed Jones finished third for Cape with a 48, while Anthony Koot’s 51 completed the team scoring. In 2018, the Executive Women’s Golf Association joined an alliance with the LPGA Foundation, renaming itself at the LPGA Amateur Golf Association. The long-running group provides a community for women golfers. LPGA Amateur chapters can be found in 110 cities in the United States and internationally. 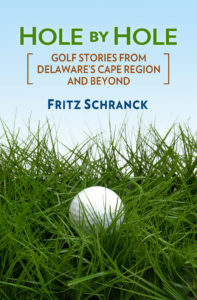 The 23d Kick-Off event for the Delmarva Peninsula region is set for April 14 at Bear Trap Dunes at 11:00 a.m. The day includes a buffet lunch, 9 holes of golf or a golf clinic, and prizes. All women golfers are invited, but pre-registration by April 7 is required. There will also be a drawing for a free membership for new members. To register for the Kick-Off, visit lpgaamateurseshore.com. For more information, contact Diane Heath at memberrecruitLPGAAmateursEASH@gmail.com. One of the most extensive changes ever made to the Rules of Golf went into effect Jan. 1. Every televised professional tournament since then has shown incidents affected by the new regulations. To help golfers understand and apply the new Rules, Rehoboth Beach Country Club is hosting a Seminar April 19, beginning at 4:00 p.m. in the club’s ballroom. The event is open to club members, local PGA professionals, and the public. Jeremy Greiner, PGA is on the PGA of America Rules Committee and will conduct the seminar. He has officiated many PGA events at the regional and national level, and will focus his presentation on the new changes. If time permits, there will be a Q & A session. The $25 fee covers the 90-minute seminar and light hors d’oeuvres. A cash bar will also be available. For more information, contact the RBCC pro shop at 302-227-3616. Almost 60 golfers participated in the first tournament of the 2019 season at Kings Creek Country Club on March 16. Jason Gaughan, Griffin Gaughan, Chase Brockstedt, and Sawyer Brockstedt won first place gross in the Frostbite Scramble. John Purple, Jr., Mitch Green, Craig Parmenter, and Kim Hutchinson won second place gross. In the net category, the team of Adam Schmidt, Jim Bushby, Sean Toner, and Jason Frost took first place, followed by Joanne Yurik, Vicki Martina, Diane Stetina, and Linda Kauffman. Kelly Brown, Mike Brown, Jim Miller, and Brian Plombon finished third. Danish shoemaker ECCO has been around since 1965, with a New Hampshire presence overseeing the American market for the casual footwear company. Its first hit in the golf shoe market came when Fred Couples began wearing ECCOs in 1999. If the coolest person on the PGA Tour could wear spikeless golf shoes, anyone could. That affiliation is still going strong, judging from the Couples poster in the ECCO booth at the 2019 PGA Merchandise Show. I took a look at a few of the golf shoe options, starting with the BIOM Hybrid 3 ($200 SRP). This new model features yak leather uppers in either white or dark shadow, a deep gray. The BIOM elements place the feet closer to the ground than other shoes. The lugs on the sole provide stability and rotational support. A Gore Tex fabric membrane provides waterproofing for the shoe’s interior, supporting a 3-year warranty. 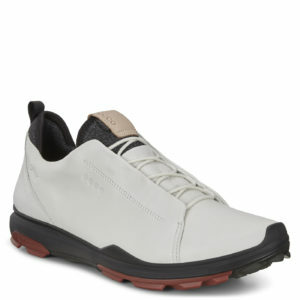 The Golf Soft model is ECCO’s bestseller, retailing for $170. In addition to white and dark shadow, the other color options are a light Navajo Brown and a medium Marine blue. These are low-rise spikeless shoes with treated leather uppers to provide water repellency. The warranty covers the first two years. ECCO shoes are available at the Tanger Outlets on Route One, as well as from private club pro shops and large golf retailers such as the PGA Superstore and Golf Galaxy.